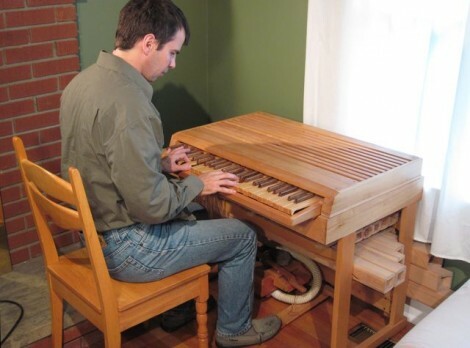 [Matthias Wandel] is a woodworker par excellence. He’s the guy behind all those wooden gear contraptions, he made cove molding on a table saw, and if the phrase, ‘don’t do this unless you know what you’re doing’ applies to anyone, it applies to [Matthias]. Now he’s getting into the fidget spinner craze, but there’s a problem in the workshop: [Matthias] couldn’t find the right sized drill bit, so he modified a Forstner bit to contain the heart of a spinner. [Matthias] has a few roller skate bearings, which are 22mm in diameter. However, the closest drill to this size was 7/8″, or 22.23mm. A drill can be ground down, so the bit was chucked into a hand drill and taken over to the bench grinder. As with most things [Matthias] demonstrates, you shouldn’t do this unless you know what you’re doing. [Matthias] does. With the bit ground down to 22mm, [Matthias] drilled a hole in a piece of wood, inserted the bearing, and completed an epic quest that was his destiny. There is no use for fidget spinners, so [Matthias] decided to make this one explode. After cutting several notches in this wooden spinner, [Matthias] applied shop air liberally and spun the spinner up until it fell apart. You can check out the video of the fidget spinner carnage below, or check out [Matthias]’ write-up here. Simple, elegant, and well executed. This solenoid engine build is everything we’ve come to love about [Matthias Wandel]’s work. If you don’t recognize his name you probably remember the name of his site: Wood Gears. In what feels like an afternoon project he put together a solenoid engine. It translates the linear motion of a small solenoid into the circular motion of a flywheel. The only specialized part in this hack is the solenoid. It has a pretty long throw and includes a hinge pin at the end. The rest is crafted mostly of wood — it is admirable how he uses that table saw like a surgeon uses a scalpel. The wooden components include a base, flywheel, very interesting bearing blocks, and a few mounting brackets to hold everything in just the right place. Add to this a coat hanger for the cam shaft, the internals of a terminal strip for the cam, some heavy gauge wire, and you’re in business. The latter two make up a clever electrical switch that synchronizes the drive of the solenoid with the flywheel. It’s amusing to hear [Matthias] mention that this engine isn’t very practical. We still think the project has merit — it’s great for learning about how simple an engine can be, and for developing an intuitive appreciation for how great commercially available motors and engines actually are. Plus, if you can mimic these fabrication techniques you can build anything. Great work on this one [Matthias], another thing of beauty! Check out his video below, then go back and check out his air-powered engine and of course, a hack that actually uses wood gears. [Matthias Wandel] is the preeminent YouTube woodworker, with dozens of machines constructed from wooden gears, amazing machines that produce perfect mortise and tenons, and home-built table saws and jointers. Actually building something instead of buying it is a hallmark of [Matthias]’ channel, and he’s at it again, building his own woodworking machines. This time it’s a 1″ wide belt sander. Of course anyone can go out and simply buy one of these sanders for under $100, but what’s the point in that when you can build one out of plywood and a motor you picked out of the trash? The design of this belt sander – just like the commercial version he’s improving upon – uses three wheels to guide the 42″ long strip of sandpaper around its course. [Matthias] is using rollerblade wheels for the front wheels. Rollerblade wheels aren’t the best shape for bearings, this can be fixed by using a table saw as a lathe. Yes, [Matthias] lathes with a table saw. He’s just that good. The rest of the frame was carefully constructed out of plywood and powered by a 1/3 horsepower furnace fan motor pulled from the trash. There are a few interesting features that make this belt sander exceptionally useful: a rounded platen behind the belt makes sanding interior corners very easy, and is something that isn’t usually found on commercial belt sanders. You can check out [Matthias]’ video below. If you’re an avid Hackaday reader chances are that you immediately recognized [Matthias Wandel’s] name. He’s been featured many many times to go along with his many many talents. Most notably, his ability to do some amazing things with wood. But really, it’s the idea that counts, and he seems to have a duffle bag full of them. [Rachel adn Justin] over at WonderHowTo recently published a full interview with Mattias. In it he shares his thoughts on where some of these ideas come from, how he approaches his projects, and even shares some advice for those just getting started.